The Knitting Pirate » In Which the Pirate Goes to the Library. In Which the Pirate Goes to the Library. ...is going to be a bouncy two-ply; I'm aiming for sport weight. 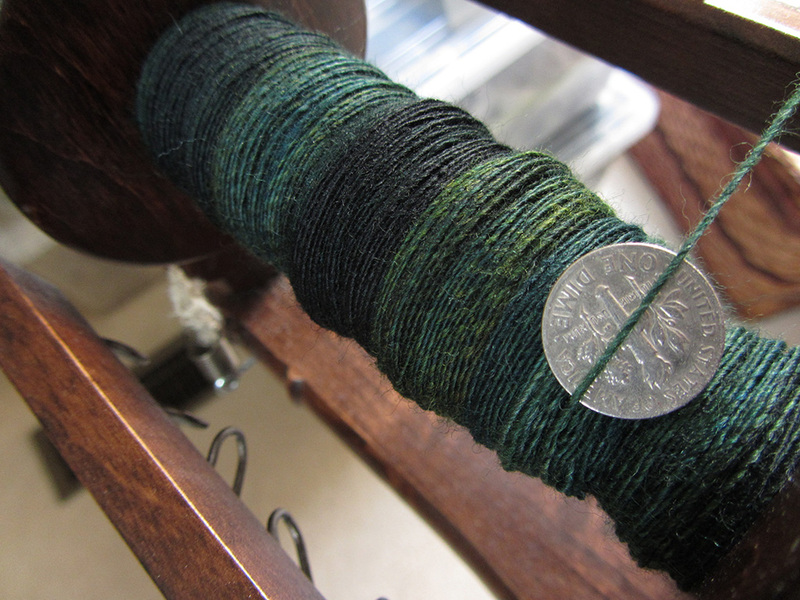 I folded the strip of fibre in half and tore it at the middle the short way, so I'll have a barber-poled yarn. 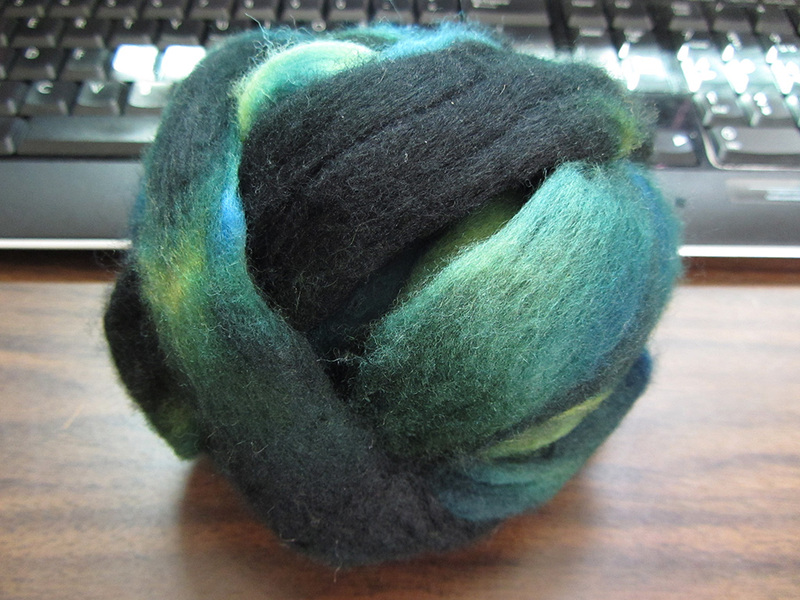 Hopefully my spinning is even enough that I don't have too much left over on one bobbin when I ply! There were eight of us in one of the library's conference rooms. People kept peeking in to see what we were doing - sometimes kids with their parents, sometimes just the adults. 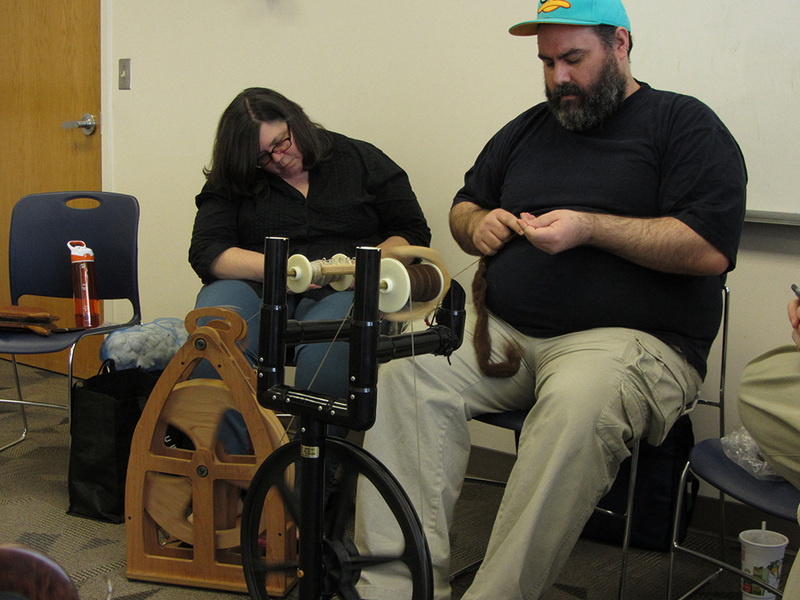 We waved them into the room and explained that we were making yarn. 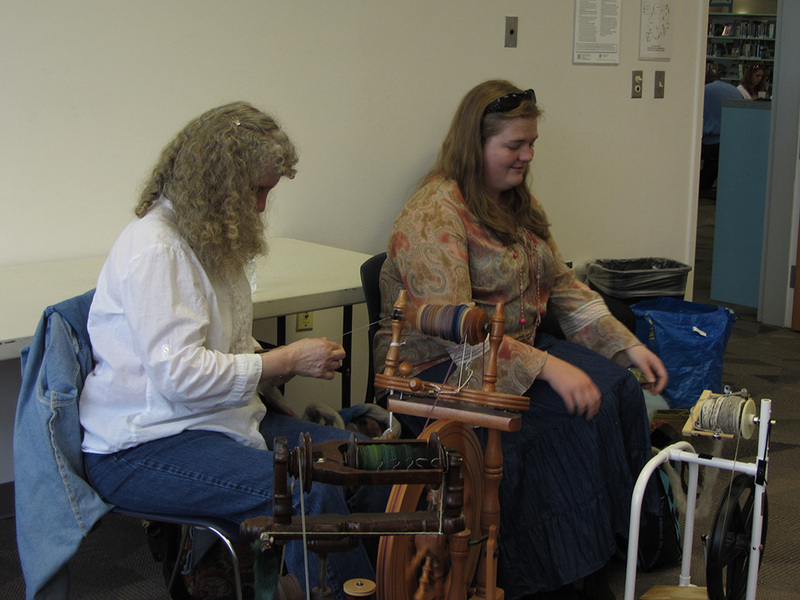 I really enjoyed watching the kids' faces; they were enthralled! 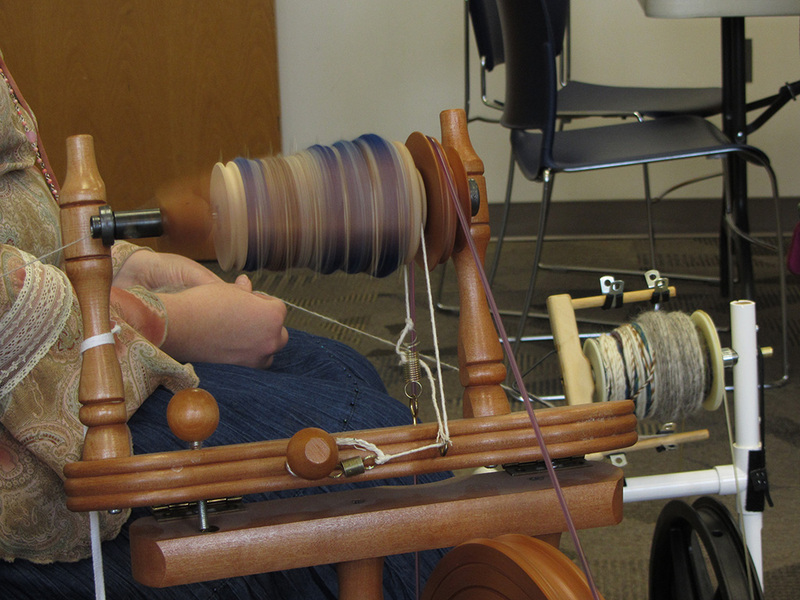 Spinning can be a solitary meditative practice sometimes, but yesterday I really enjoyed spinning with a friendly group of people. It was really neat to see what everyone else was working on, and I'm definitely looking forward to going back next month. By the end of the afternoon I'd finished the first half of the fibre and gotten started on the second half. It's drafting beautifully and I feel like I'm becoming a much faster spinner, though I'm sure as I get even more practice I'll pick up even more speed. The next question, of course, is "What shall I knit with this?" I guess that will depend on how many yards of yarn I come up with. It could potentially be striped with another yarn if I need it to go farther for whatever project I end up choosing; when I bought it I remember thinking that it would be a nice contrast against a natural cream or oatmeal shade. 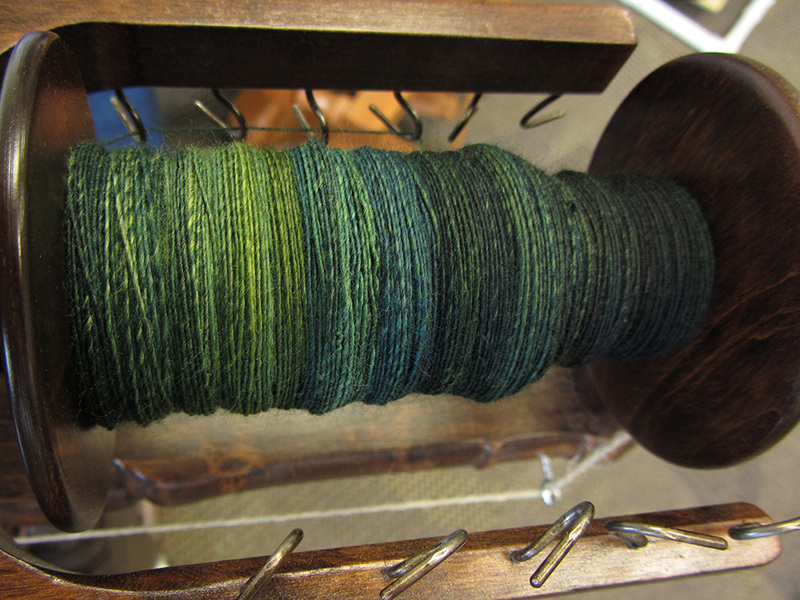 I'm definitely keeping this one for myself, because it's souvenir yarn, but I'm planning to have some handspun up for sale in the Etsy shop soon. This entry was posted on Monday, April 15th, 2013 at 10:07 and is filed under spinning. You can follow any responses to this entry through the RSS 2.0 feed. Both comments and pings are currently closed.